Congratulations on the purchase of your VAC PAK PCB or kit. 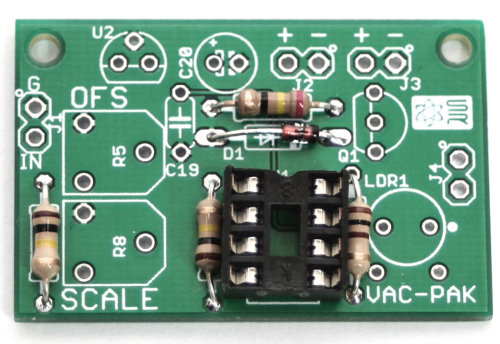 This circuit allows you to convert your CONTROL VOLTAGE (MAX +10V, more may burn up your vactrol!) source and get variable resistance out! Set the scale and offset via two trim-pots and find your usable range somewhere between 750 ohms and up to 4M. This is a fairly easy build, but please make sure you follow the instructions in order to help ensure proper performance. First populate the 4 resistors as shown above, turn board over to solder, then clip leads. Next add the diode by aligning the black-striped end of the diode with the white-stripe end on the white silk-screen graphic. Now place the IC socket by aligning the notch in the top of the socket with the notch on the white silk-screen graphic. Turn the board over, solder and trim leads. You can now add your IC as well by aligning the notch on the IC with the notch on the socket. Next we are going to wire up the project and we will start with the jacks. A 3.5mm (1/8″) jack OR a 1/4″ jack can be used. The jack takes in the Control Voltage. Cut and strip some of the wire to (desired length) included in your kit and solder one end of the wire to the connections shown above and solder the other end to the PCB at J1. Now attach more wire as shown above. 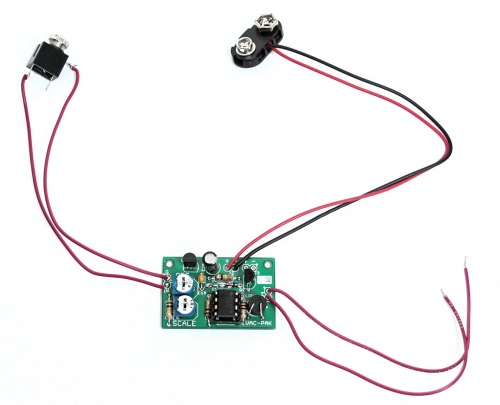 You can connect the 9V battery snap to either J2, or J3, or you can just connect J2 or J3 up to your project’s on-board voltage source. The other (either J2 OR J3) connector allows you to daisy chain multiple VAC PAKS to the same power source. 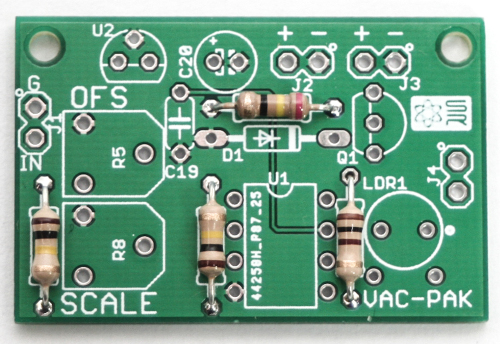 The VAC PAK has an onboard 5V regulator, so this project can be powered with 6-18V DC. The wires connected to J4 work as a variable resistor! Connect these ends to a spot of resistance that you would like to now be variable resistance! 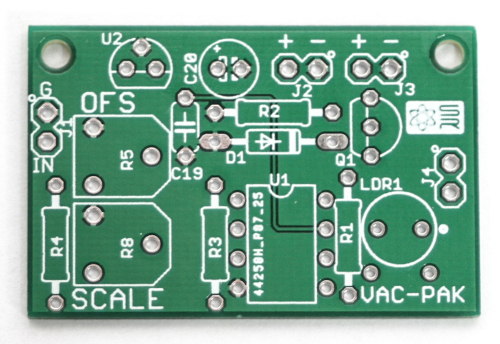 The trimmers allow you to offset and scale the incoming voltage as to get a usable range that works for your circuit. Enough! Lets get this into your circuit and start bending with CV power! Hey guys – R1 & R2 seem to be reversed on the BOM vs the photo above…which one is correct? Sorry for some Noob questions: I am lining up the white dot on the Vactrol with the PCB (i.e the long leads of the Vactrol are on top of the PCB and the short leads underneath), but I notice that if I do that the printing on the Vactrol is upside down compared to your photo…for it to be the same, the white dot on the Vactrol would be opposite the white dot of the PCB. No worries on the printing. Just match the dots up. Thanks! The PHOTOS are correct and NOW the BOM and Visual BOM are both fixed. Thanks for catching that! The BOM is the most up-to-date parts list. We feel this works better in the circuit. Hi Gael, I’m not sure, I would suggest comparing the data sheets of the two ICs. Can I solder the two wires from the battery power input to any euro modules power pads? Thanx! Jenz, that’s what I do and works fine. 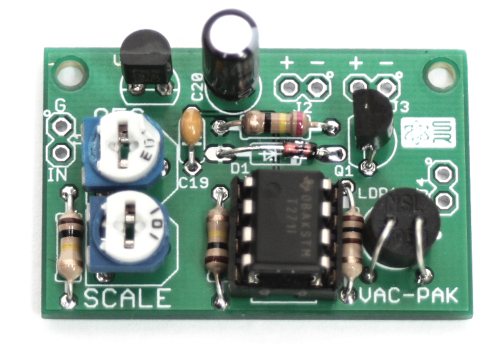 Voltage regulator takes care of the rest. Gael, I use TLC271CP and works fine.